Big Data – what’s all this fuss about? The concept of Big Data has been more and more noticeably present in everyday dictionary of each digital company during last years. Everyone feels that Big Data is not only a good direction but, frequently called the oil of the 21st century, may even become a gold mine. What exactly is Big Data, what value and what potential does it have and, last but not least, how to take advantage of it? Processed data is information. Processed information is knowledge. Processed knowledge is wisdom. At the beginning, it is worth mentioning that data in its raw form has no significant value. Only processed properly gains its importance. Big Data refers to a large volume of diverse and fluctuating sets of structured and unstructured data that requires a different than traditional handling techniques and processing approach in order to uncover the insights, data meaning and eventually to get valuable business insights. In 2001 META Group published a report, presenting the Doug Laney’s 3V model according to which Big Data can be described by three values: volume (quantity: organizations collect data from a variety of sources: business transactions, social media, data from sensors, data exchanged between devices), velocity (speed: data is created and delivered extremely fast and must be handled with an appropriate near real-time regime), and variety (diversity: data comes in a variety of formats ‑ from structured, numerical data in traditional databases to unstructured text documents, email, video, audio, data storage tags or financial transactions). Big Data helps to find the answer to trends and behaviours before a particular question has been even asked. Now, bearing in mind that collecting, processing and analysing large amounts of data allows obtaining new knowledge, how to make the best use of it and improve a process of business decision making? Big Data is applicable everywhere where a large amount of data is accompanied by the need of acquiring new information or knowledge. A set of demographics, behavioural and location data allows analysts to understand the motivations of customers, their choices and finally optimize activities to be taken. Thanks to this, they know, for example, how to recognize customers’ interests, preferences or differentiate dissatisfied customers from those who are contented. The results of data analysis enable identifying, for instance, which communication channels are more effective than others and therefore allow generating higher profits. Big Data affects the organization’s development in virtually every market sector. Big Data allows gaining comprehensive knowledge which is the key to understanding the client and increasing his satisfaction by offering him the best tailored services. It is also a perfect tool to minimize risk and reduce potential frauds as well as ensure compliance with the regulations of supervisory institutions. In telecommunications sector analysing Big Data is used for monitoring network traffic which enables forecasting network capacity, network services optimization and thus improvement of services. It facilitates customer acquisition and retention, improves the quality of customer experience and customer service as well as reduces customer churn. Based on usage patterns derived from Big Data, products and services can be customized. It also allows using real-time marketing on a scale incomparable to other industries. In public institutions, Big Data can be used to improve management, optimize costs, improve the quality of citizens’ services or counteract crime. In case of health protection, the reaction time as well as meticulousness and accuracy play a key role. All procedures must comply with detailed regulations. Big Data allows discovering unknown relationships and improving patient service. Big Data in tourism is used to identify travel patterns, anticipate new trends and respond to customer demands by preparing customized adequate offers, promotions, discount coupons etc. A Big Data insight allows also negotiating rates with suppliers and uncovering hidden sales opportunities. All this leads to an improvement of the client’s experience and to maximisation of the company’s revenues. It is also a sector where, based on Big Data, a real-time marketing can be successfully used. In nowadays very competitive market it is crucial for the enterprises to analyse large sets of data in order to improve the quality of products, increase production efficiency and reduce losses. Proper data management allows building long-lasting relationships with customers which is of great importance for development in the retail trade industry. Big Data helps traders develop optimal and the most effective ways to reach their customers and prospects, to manage transactions and to regain lost sales opportunities. The amount of data that is generated and stored on a global scale is not only barely imaginable, but it is also constantly growing. Still, only a small percentage of information is subject to analysis. As reported in IBM Marketing Cloud study, 90% of all information in the world has been generated in the last two years. These statistics show the pace at which the amount of data increases. In practice, this means that there is a massive potential for business-related information that has not been used yet. Thanks to advanced analytics, data from various sources may be used for making more relevant business decisions, time and costs reduction, creating new products offers, determining causes of failure, malfunction, defects in near real time , detection of abusive behaviours before they significantly affect the organization or generating coupons, based on customer’s shopping habits. The analysis of large data sets, obtained, among others, from internal systems or social media can be translated in marketing into: better price management in time, better use of advertising budget, getting to know customers and their preferences, precise matching the offer to a particular customer, optimization of the path-to-purchase or reduction of the conversion costs. A set of elements which marketers can use to influence the market, often recognized in terms of four “p” (4P) is: product, price, place and promotion. Big Data can address and improve functioning of each of these aspects. Data on the popularity of individual products allows identifying the most attractive products, anticipating possible demand and managing store supply. Quantitative and qualitative data allow also better developing and improving the product. Big Data allows dynamic price formation, depending on the demand. Prices can be modified at different times, and increase for example in case of growing demand for products or services that run out fast. 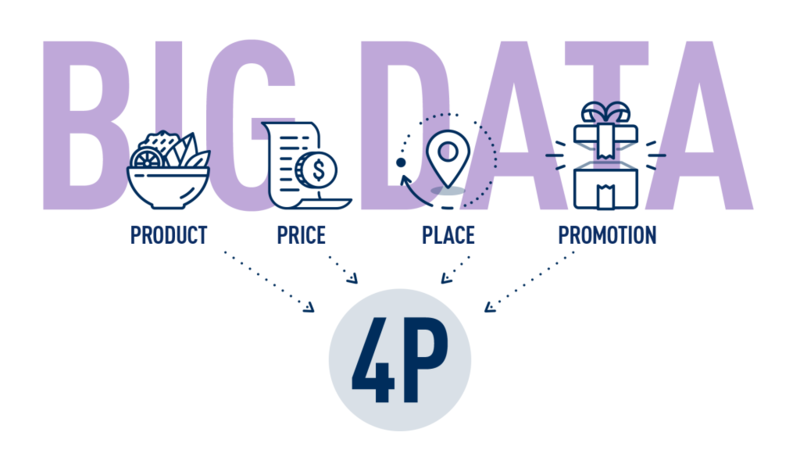 Big Data enables defining in what places the clients currently or frequently are, which thus allows choosing the most efficient communication channel and the best promotional activities. Data allows measuring the response to the promotional tactics more accurately as well as it can help predict the reactions of specific recipients to a given product. It is important to remember that obtaining a complete view of a customer, organization condition and converting data into specific marketing actions often requires integrating many tools, e.g. tools analysing behaviour on the website and in the mobile application. To make sure that using Big Data will provide measurable marketing success, information should be delved to expose subsequent layers and discover richer knowledge resources. The knowledge gained from the original data analysis may be a subject of further investigations, allowing a fuller, deeper understanding of the examined issues. This level of knowledge allows the creation of specific strategies and growth-enhancing activities. TASIL relies on the power of real-time marketing and Big Data itself. It knows well that data is the fundament, context is the key and that cutting-edge technology is crucial to tie it all together in order to uplift your customers. TASIL helps marketers prepare the most relevant and effective advertising campaigns. It analyses the Big Data and makes the best possible use of it, so that you do not have to worry about doing it yourself and just enjoy taking advantage of the benefits of proper utilization of large data. Based on Big Data, coming from the most reliable sources, such as mobile phone operator, and processed properly, TASIL’s functionalities were created. 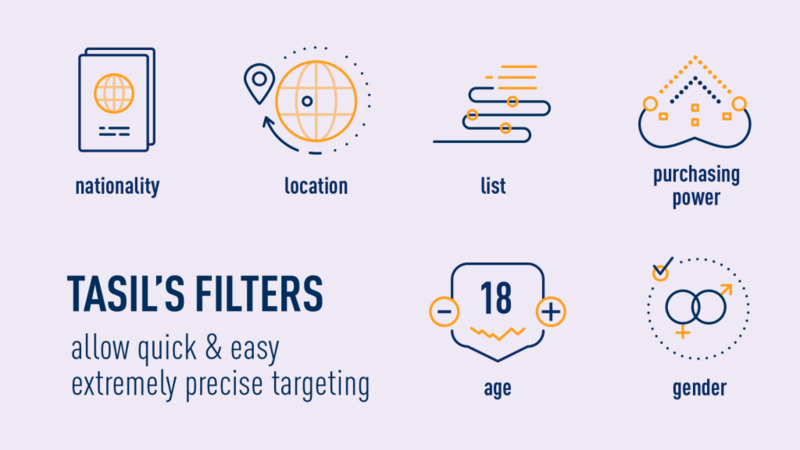 TASIL’s filters allow easy and the most accurate campaigns’ targeting and thus, using them increases the chances for the campaign to be successful. Marketers can choose from 6 available filters including: nationality, location, list, purchasing power, age and gender or ask TASIL to create new, custom filters. 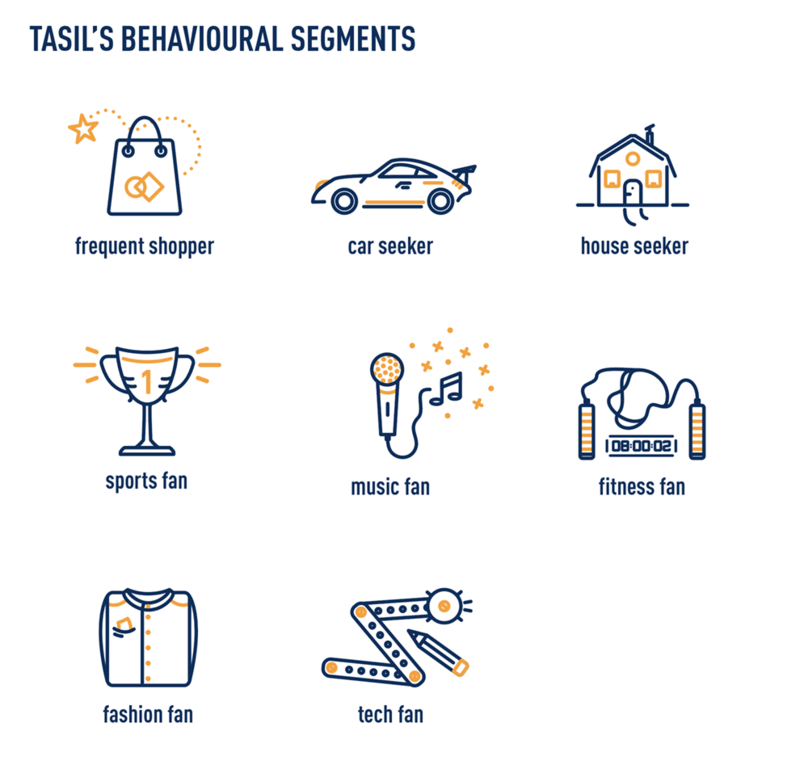 TASIL created also behavioural segments, based on Big Data analysis as well, and these are: frequent shopper, car seeker, house seeker, sports fan, music fan, fitness fan, fashion fan and tech fan. Segments can be used jointly or separately from filters and they allow even more precise campaign targeting. It is Big Data and its analysis that allows TASIL to be always right! Since TASIL gives the opportunity to analyse performance of each campaign thoroughly, the data deriving from such analysis can be used by the marketer for re-targeting next campaigns, even more accurately. Marketing activities based on Big Data are launched on an ongoing basis, in real time, which is why they are always based on the most current information about the customer. Such a dynamic adjustment of communication and content to the real state allows reaching customers with the offer of exactly what they currently need.